One of my favorite video games as a kid was a rather unlikely one. It wasnt the coolest graphics or excellent control. It was about story and animation. It was, of course, Dragons Lair. The odd laser disc game by famed animator Don Bluth. Not surprisingly, I tried to recreate a bit of the game's feel on my ZX81. My attempt is, of course, Novembers Program of the Month. My version of Dragons Lair lacks the awesome animation of Dons studio for obvious reasons. 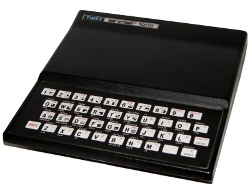 The ZX81s weak graphics not withstanding, I actually enjoyed my attempt. It retains the basic ideas. A scene is displayed and you have to press the right direction at the right time to win. In that, it actually does a decent job. This version recreates a number of scenes. It includes the falling floor, the rolling borders, and the falling skulls. Its hard to relate them to the story unless youve seen the original. Again, its because of those pesky graphics. They are there though and actually dont play half bad. In fact, the controls are about as finicky as the originals. The opening castle, though, actually looks pretty good all things considered. The ending dragon isnt so bad either, although he does look a bit droopy. Dragons Lair code isnt all that bad. Not surprisingly, almost all the code is around printing the various graphics and animations. Very little of the code is for movement. I suspect that was the case for the original game as well. The game mechanics are actually simple if then else scenarios. If you hit the right key, continue. If you dont, you die. An old but goody, I think my version of Dragons Lair is a pretty good attempt, even if not the same as the original. Now, if I can only find those Dragons Lair II printouts.